Saturday night, Tom and I met friends at the Indian Crossing Casino to hear Otis and the Alligators, a great blues band. As far as I know, the Casino has never lived up to its name in the gambling sense. It’s been a concert arena since the days of Glenn Miller and before. Set on (and I do mean ON) the Chain O’Lakes, it’s an unpretentious barn of a building with a bar, a large deck over the water, and a casual, beachy vibe. Sunday night, we grilled out and ate dinner on the deck. This sums up a perfect summer weekend: friends, great music, and outdoor dining. The herbs take up residence on the deck (along with the tomatoes and peppers) so I can grab a few sprigs quickly as I cook. 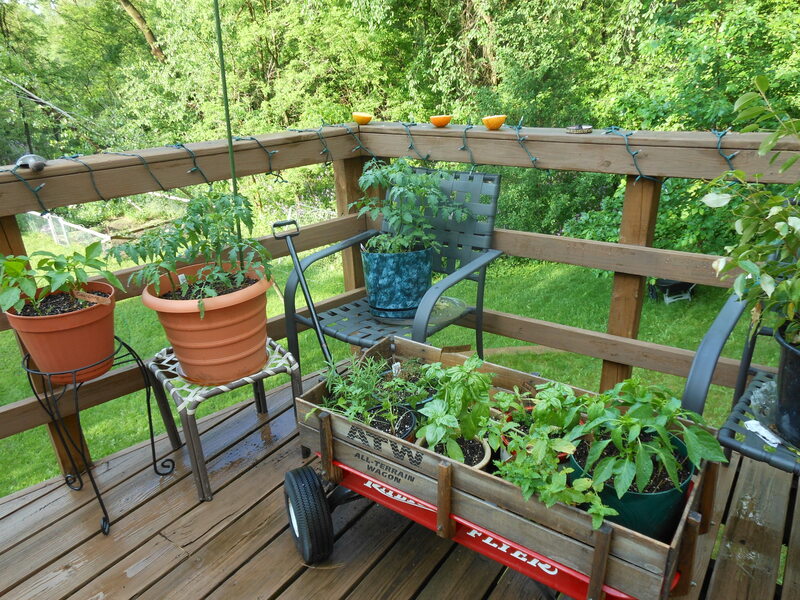 Herbs, tomatoes, and peppers on the deck. The oranges on the railing are to feed the orioles. The joy of these meals is that they’re simple, relaxed, and usually pretty darned healthy. The chicken marinade is simple but full of big flavors: dijon mustard, fresh lemon juice, fresh herbs, and a glug of fruity olive oil to smooth things over. My basil was getting leggy (already! ), so that was the featured herb, but thyme and rosemary also work well, solo or in combination. It’s not a vast quantity of marinade, but it doesn’t need to be. 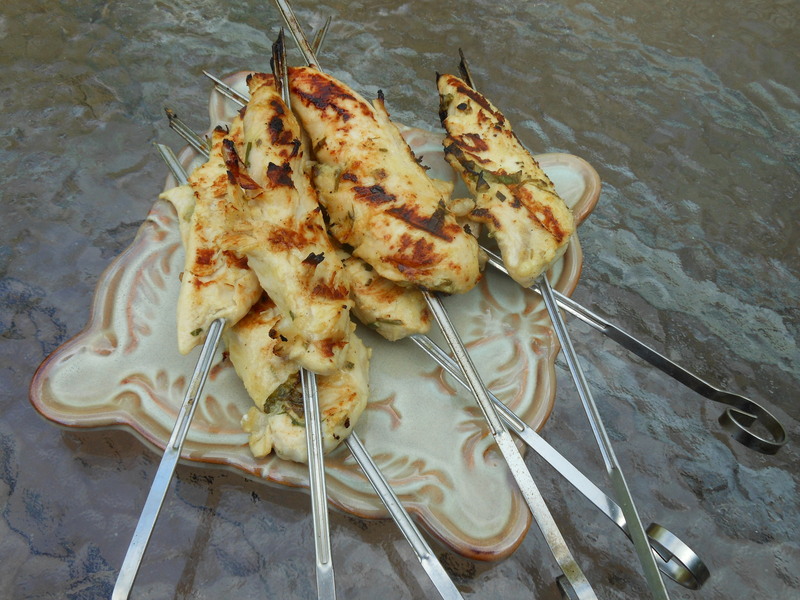 I used chicken tenders on skewers this time, but I usually just pound boneless breasts thin and grill them. 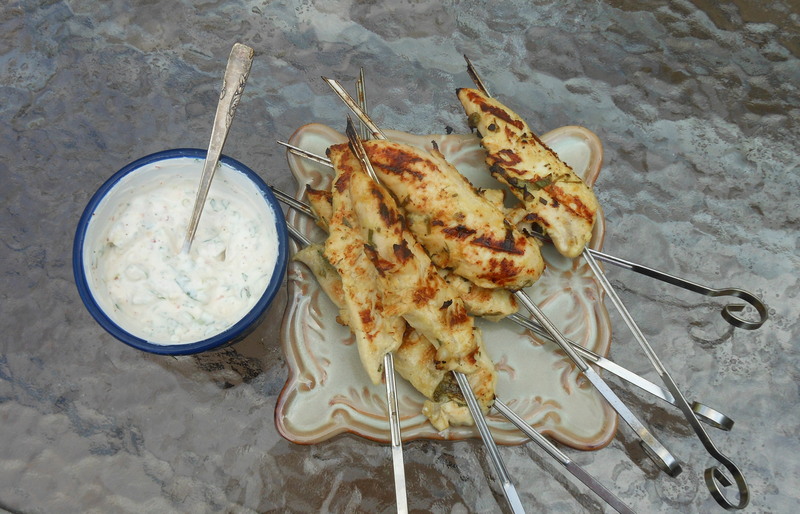 Try cutting the chicken into thin strips and skewering them satay-style for appetizers. The grilled chicken is tender and juicy, with much more flavor than you usually associate with white meat. The sauce also features lemon and herbs, with a focus on scallions. Lemon juice brings some bright acidity to the sour cream. If you prefer to use Greek yogurt, try using lemon zest instead of juice since the yogurt is already tangy. The honey mellows out the tanginess without adding the slightest bit of sweetness, by the way. We often grill vegetables or fruit as well as a protein, but this time I set some red bell peppers and onions in a covered skillet with olive oil, white wine, and a drop or two of honey for a slow braise. At least 2 hours before you fire up the grill, whisk the mustard, lemon juice, oil, herbs, salt and pepper in a small bowl. (I use a measuring cup with a spout to make pouring easier.) Put the onions and chicken an in a sealable plastic bag and pour the marinade over. Seal the bag and give it a good rubdown to distribute the marinade over the chicken. Refrigerate for at least 2 hours or up to overnight. Meanwhile, make the scallion cream: Stir together the sour cream, lemon juice, scallions, honey, salt and pepper. Refrigerate until ready to serve. The sauce is best if it can also sit in the fridge for a few hours. Fire up the grill. Pull the chicken pieces out of the marinade (no need to wipe off) and grill until golden and cooked through. I used boneless, skinless chicken breast tenders which I skewered; they took about 4 minutes on each side on a hot grill. We’ve also done this with boneless, skinless breasts pounded thin, which take about the same amount of time. Serve with the scallion cream. This entry was posted in main courses, meat, poultry,and fish, sauces and tagged chicken, dijon, green onions, grill, healthy, lemon, mustard, sauce, scallions, sour cream. Bookmark the permalink. I love the garden in the wagon. I have tried to grow basil, cilantro and parsley and in South FL they all died of a mysterious bug but now that we are in VA I would like to try again! Congrats on your garden and your site! I’m no garden expert, but I did live in Virginia for several years. You should have an easy time growing herbs there, easier than I do here in Wisconsin. I do miss the growing season there. Good luck!